Jacob must have counted sheep and kept tallies, since part of the flocks he managed belonged to his uncle Laban. Jacob understood that what he counted was changing: birthing, maturing and dying. Ancient people, understood that everything changes. They used numbers for counting nature’s objects (e.g. sheep) as the objects themselves changed. Jacob’s practical, dynamic, arithmetic is unlike the complex mathematics scientists use for their earth histories. Even if ancient atoms were not identical to modern ones, 1 + 1 would still be equal to 2. However, everything that could be counted with the number “one” would continue to change so that ancient “ones” would not be like modern “ones.” In such a universe, logic and mathematics would only work locally and in nearby spaces and times. In such a universe, we could not understand earth history mathematically because nothing in the ancient world would work exactly like it does in the modern world. Let’s test the basic assumption used in mathematical versions of earth history. Giant telescopes observe galactic history, the only history that is visible as it happened. We observe that many early galaxies were tiny, without starry arms. The light from these ancient galaxies often shines at less than 10% of the frequencies emitted by modern hydrogen atoms. Indeed, there is a general relationship between increasing distance and the slowness of ancient atomic light clocks. This relationship is also observed in four spinning spacecraft sent into the distance solar system. NASA used transponders on those spacecraft to return a signal that originated with local, hydrogen-maser atomic clocks. When the returned signal was compared to the present speed of the atomic clocks, NASA discovered an anomaly. NASA’s atomic clocks were accelerating at approximately the same speed (relative to distance – the past) as the hydrogen atoms in billions of distant galaxies. Please examine the pictures of primordial galaxies from the HUDF. 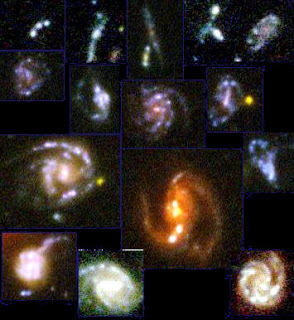 Early galaxies had strange shapes, compared to local galaxies. Their red cores are often surrounded by strings of equally-spaced, bluer star globs. In countless examples, we observe that the star globs accelerate out and spread out as galaxies intrinsically grew into huge, local, growth spirals. Visibly, the properties of all matter continue to change relationally. Relationally means the clock speeds change along with matter’s volumetric and inertial properties. How can we be sure? The star streams in billions of galaxies violate every law of physics as they emerge from minuscule galactic cores . It is not surprising that their cosmologies focus on undetectable, mathematical things such as invisible matter. Many scientist imagine that 84 % of all the matter in the universe is invisible. They allege that the vacuum of space time is stretching, pushing away distant galaxies that are standing still relative to their local vacuums. The differences between ancient light-clocks and modern ones are accounted for by stretching vacuums. All the magical stories about a vacuum explosion, invisible black holes and vacuums that pull more energy out of the vacuum to accelerate the stretching of the vacuum are unnecessary if they could only question the fundamentalist assumption upon which their science was contrived. What is visible in cosmic history only fits a literal version of creation, not the traditional exegesis that came from the Latin Vulgate. First God created (completed action verb) the heavens and the Earth. The earth was (completed action verb) formless and void. Then God’s wind dithered in unbroken continuity as He continued to command light to continue to be (imperfect verbs). Evidently that was when matter began to receive form as a relation with light. To this day, light continues to dither around within all matter, giving it extension. Half way through the creation week, Elohim continued to form the Sun, Moon and stars and continued to make them into things that spread out (Hebrew raqiya). It is not the vacuum that spreads itself. It is galaxies that continue to grow from the core of formless matter God created first. Repeatedly the Bible explains that God continues (in unbroken continuity) to spread out the heavens and the Earth. Indeed, Earth’s continents only fit together on a tiny globe without major surface seas. The sea floors are younger than the continents as they continue to form along a global expansion seam as emerging, molten lava solidifies. The gif of the growing Earth is from Michael Netzer who allows distribution with attribution. What is wrong with mathematics? We observe that everything in the universe (that can be numbered) is changing. There is nothing wrong with simple arithmetic that accepts the visible reality. When mathematics is mingled with metaphysics to define undetectable things, the result is the greatest system of mythology in history, scientific accounts of beginnings. Carefully test, with the light from long ago, the basic creed that is the foundation for mathematical science. If you accept what is visible as real, rather than undetectable mathematical entities, your blinder will be removed and you will be able to accept the visible evidence. God can make foolish the greatest system of knowledge ever invented by man, western science. What glory He will get when He reduces the wise to fools and proves that no one can come to know Him through philosophy, only by the child-like faith of a sinner that trusts His promises alone for salvation.